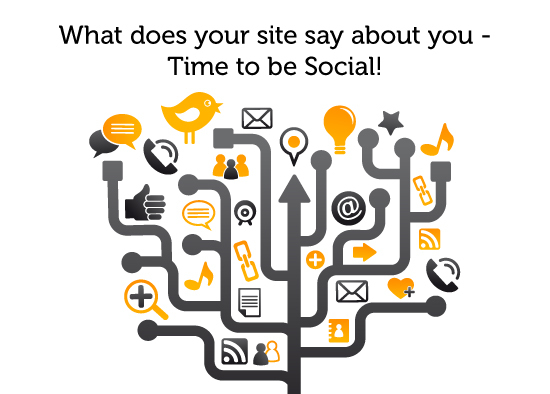 What does your site say about you – Time to be Social! Social media is nothing new to the online industry but still many companies haven’t embraced it fully. There are many platforms to choose from with many ways to Integrate into your site. If you want to go down a subtle approach and already have pages setup for something like Linkedin, Facebook, Google+ or Twitter – then a static link might be just what you need. This sort of approach suits a strategy in which your aim is to increase the amount of followers you have. Having people & clients joining you on Linkedin, Facebook, Google+ or Twitter will help you fully engage with a person, whether that be on a B2B or a personal level. This will in turn increase the overall social exposure of your company. If you don’t have any social pages setup there are other ways to feature social media on your website. Most social networks provide buttons that can be Integrated – Facebook has a Like Button, Google+ has the +1 Button & there are even multi-share buttons such as ShareThis. Important B2B links are part of some multi-share buttons & feature things like Linkedin which is essential for building client based social networking. All these features will help increase your social exposure and connect with an individuals profile even if your not connected with them directly. This means less data to manage in comparison to having your own Facebook or Twitter page. If you have a Facebook page or Twitter page there are some great plug-ins to show you latest posts or Likes. This is a fantastic way of keeping fresh content flowing throughout your site & website users up to date with your latest social related activities. Having these feeds generating on a daily or weekly basis will benefit the sites SEO as it’s important to produce new & unique content each time the sites re-indexed by search engines. Many companies will worry about negative use of social media, this is always a small risk but can be controlled via your own Facebook, Google+, Twitter pages deciding what shows and what doesn’t. In the end Social Networks are everywhere and people will find, post and share your content eventually.